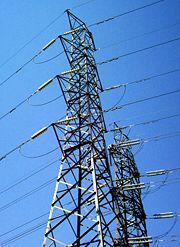 Electrical power is distributed via cables and electricity pylons like these in Brisbane, Australia. Electric power is defined as the rate at which electrical energy is transferred by an electric circuit. When electric current flows through a circuit with resistance, it performs "work." Various devices convert this work into many useful forms, such as heat (electric heaters), light (light bulbs), motion (electric motors), and sound (loudspeaker). Electricity can be produced by generation or from storage such as batteries. The SI unit of power is the watt. Electric power, like mechanical power, is represented by the letter P in electrical equations. The term wattage is used colloquially to mean "electric power in watts." In direct current resistive circuits, instantaneous electrical power is calculated using Joule's Law, which is named after the British physicist James Joule, who first showed that heat and mechanical energy were interchangeable. is the resistance (Ohm or Ω). In alternating current circuits, energy storage elements such as inductance and capacitance may result in periodic reversals of the direction of energy flow. The portion of power flow that, averaged over a complete cycle of the AC waveform, results in net transfer of energy in one direction is known as real power (also referred to as active power). That portion of power flow due to stored energy, that returns to the source in each cycle, is known as reactive power. Power triangle. The components of AC power. The ratio of real power to apparent power is called power factor and is a number always between zero and one. This page was last modified on 18 September 2017, at 21:48.